Take an evening walking tour with an in-the-know guide through the heart of Manhattan’s booming cocktail scene. You’ll visit an eclectic collection of bars in the East Village, listening to tales of speakeasies and gangsters along the way. Sample three delicious libations with light snacks, and learn how to make craft cocktails yourself while discovering some of the best places to grab a drink in New York City. Numbers are limited to 12 on this small-group tour, providing a more personalized experience. Meet your guide in Tompkins Square Park, where you’ll start your East Village cocktail tour at a drinking fountain gifted to the city by a temperance advocate who extolled the virtues of water over whiskey — an appropriate landmark for discussing the Prohibition era and New York City’s resurgent cocktail culture. 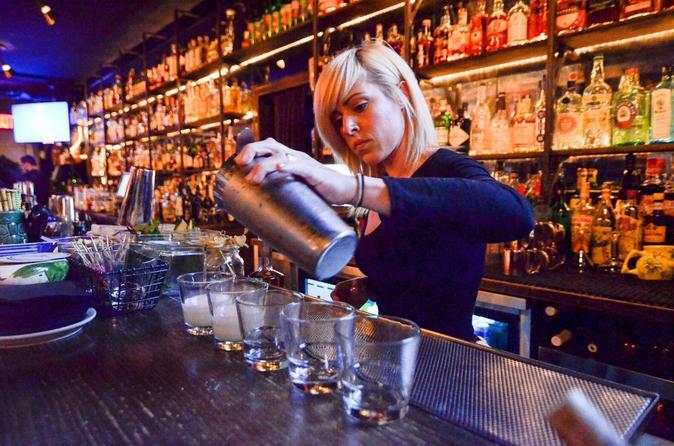 Then set off through the neighborhood, visiting three cocktail bars to sample a drink, meet expert bartenders and mixologists, and learn how they make their craft cocktails. Check out sites of former speakeasies (hidden, illegal bars that operated during Prohibition), and hear tales of the gangsters and politicians that kept the liquor flowing despite the 18th Amendment. Swing by Astor Wines, Manhattan’s premier wine and spirits shop, and learn what to look for when purchasing different spirits. Your guide will highlight local microdistillers who produce delicious whiskeys, rums, vodkas and gins, and help you pick out the perfect boozy souvenir to take home with you (own expense). In between stops, learn about the craft-distilling and cocktail movement, and hear all about the East Village and its history, including the best tucked-away places to grab a drink or a bite to eat.